Palisades Park is a world-renowned urban forest with spectacular views of our western horizon. It's a unique biome, a western landmark, and our city's most valuable asset. Today it needs a little help from its friends. A visit to the Ballona Creek Wetlands discovered several great blue herons, snowy egrets, godwits, and others. 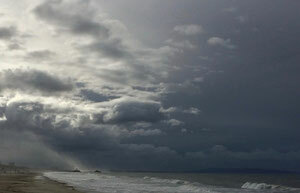 A double header storm system brought 1.48 inches of rain to Southern California, March 6 and 7th. Photo taken with an iphone looking south towards the pier from Carl Rogers State Park. Bluffs Improvement Underway! 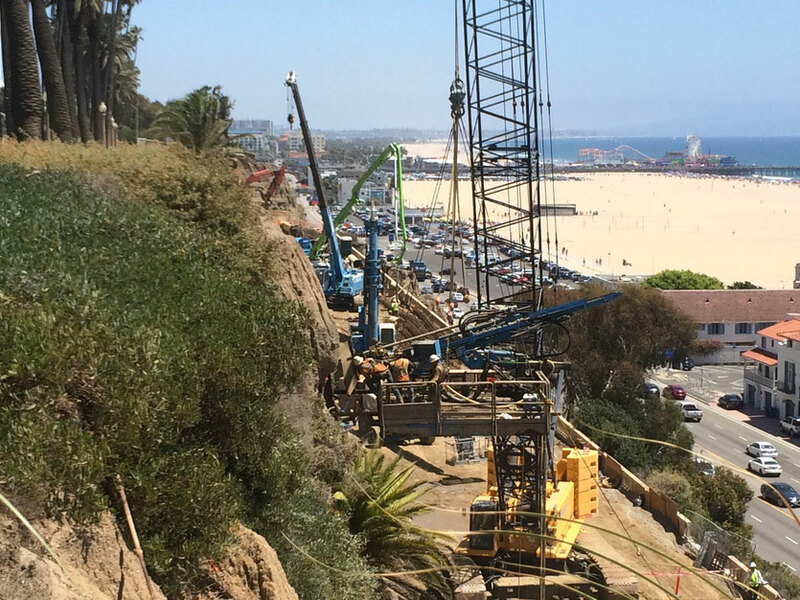 New California Incline Develops Apace! Above workers place "nails" and grout into the famous Palisades Bluffs. See Story below. NOTE: In the background, the redevelopment of the California Incline continues apace. See story on the bluff Improvements! 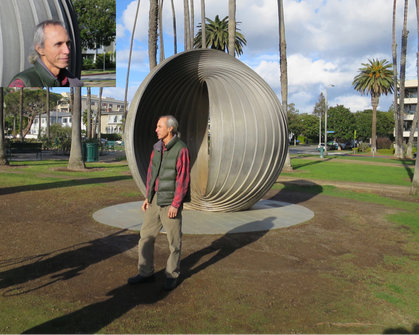 California artist Baile Oakes is in town to rally support for the restoration of his the popular Palisades Park sculpture, "Gestation III." First installed in 1990, the sculpture is designed to capture the setting sun during winter solstice. Learn more about this famous sculpture, the artist, and the city's restoration effort. "Palisades Park is one of the great parks of the world...It is also special because it represents the beginning ...of the American continent and overlooks the Pacific. It has the power of imagination by its presence." 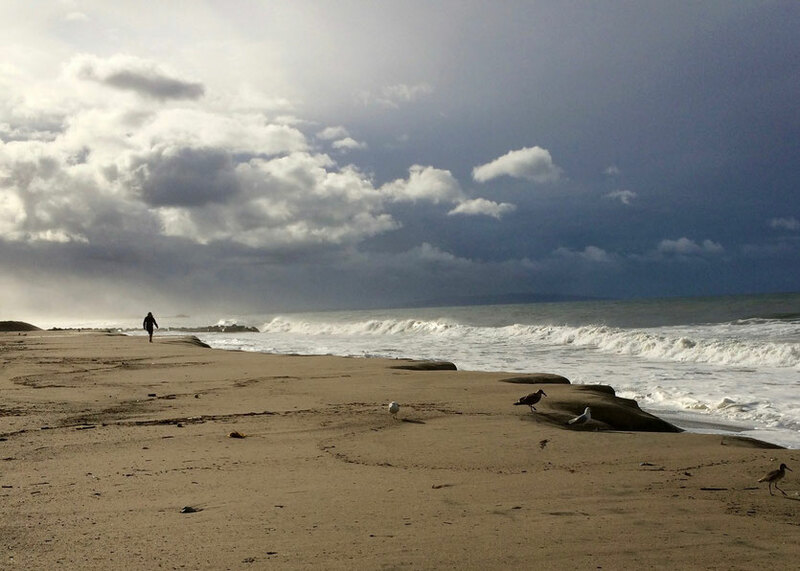 "This is my to go spot when I need a day of clarity and escape from the hustle and bustle of everyday frantic LA life. I absolutely LOVE it here. The view is amazing, the path is gorgeous, and the air is always crisp." "This park is a little slice of heaven. I love to come here on a Sunday afternoon and go for a walk and then lay out on the grass and read magazines, stare up at the palm trees ... I always feel at peace here. ... when I finally tear myself away ... I always feel so refreshed and recharged. This is truly one of Los Angeles' gems." "Run, sit, read, or ponder your navel it's good for it all. The park has monuments, the park has shade, the park has benches what else do you want? Oh duh it's the best damn view of the Pacific Ocean at ground level in the LA area!" "This park has been featured in many movies, tv shows and in cinema. 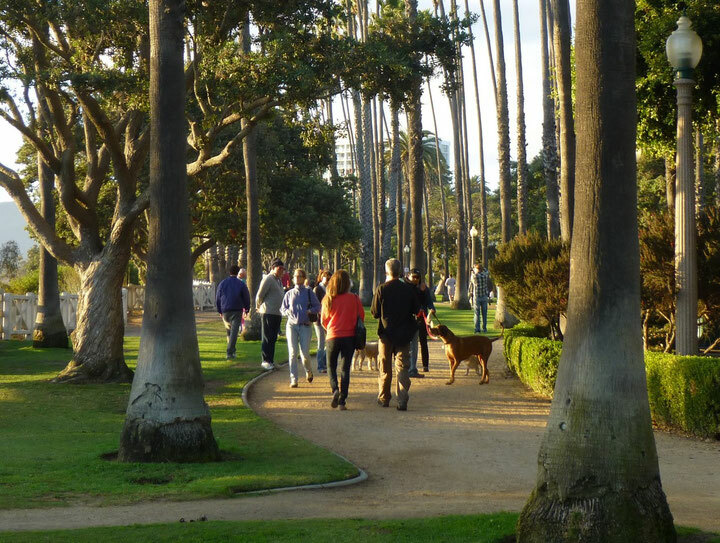 Even though Santa Monica tends to be very crowded and congested, this park is truly a hidden gem in the bumper to bumper concrete jungle of west LA. I highly recommend you come here and just watch a relaxing sunset, or bring your journal and write some poems!" "This is a highly frolicable park. Stare at the ocean, it is free therapy. Bring people visiting LA to this place with a packed lunch. Guaranteed great day." 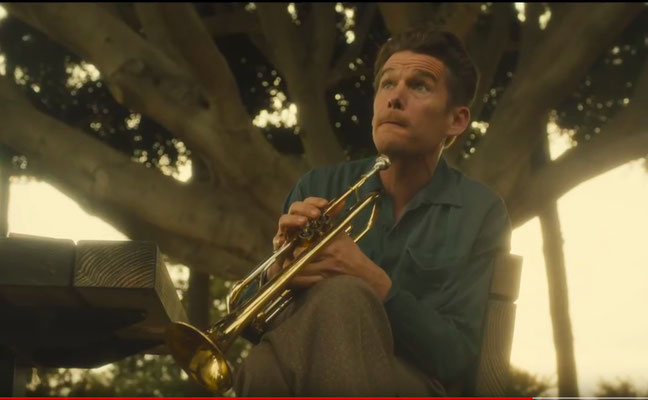 "Palisades Park is where the real L.A. meets the movie L.A. Homeless people hang out here, yes. And why not? It's paradise. The city runs to the ocean and is stopped by a crumbling cliff. It's here that Palisades Park, a strip of immaculate green grass crisscrossed by paved and earth paths lined with trees and benches, stretches for several miles. There's a war memorial, a world-class rose garden, large-scale sculpture, drinking fountains and clean restrooms. What more do you want?" "In my opinion, this is SM's version of Central Park. Where else can you run on a trail on a 3 mile bluff that over looks the ocean? There are rose gardens, a huge variety of trees, tables where old people play chess and picnic, tons of spots to throw down a blanket and read..."
Does Palisades Park face a tragedy of our own making? 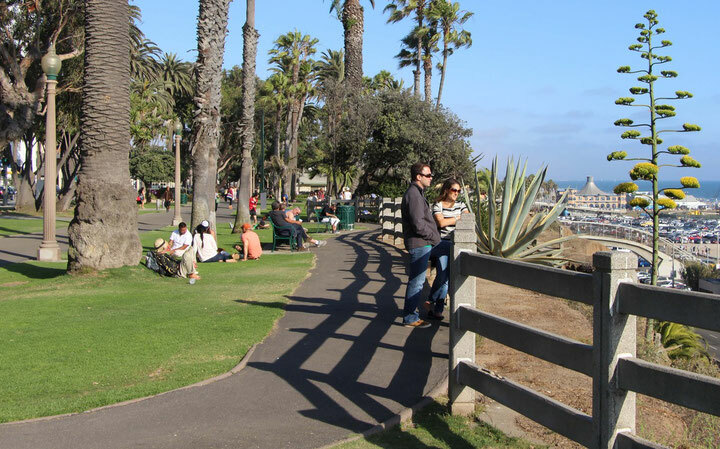 Palisades Park is the most popular park on the west coast, popular with tourist, residents, and athletes. With such intense use it now faces a tragedy of the commons. That is, although each individual user of the park intends no harm, the cumulative total impact is destroying the park. For now the greatest impact is to the parks soils and its grasses. See current documentation in photos and personal observations here. Learn more about what economists call "a tragedy of the commons" and how it applies to Palisades Park. Is Palisades Park Passive or Active? A City Council decision could tarnish the Park's legacy, alter its historic character, and commit the Park to a future of more abuse. 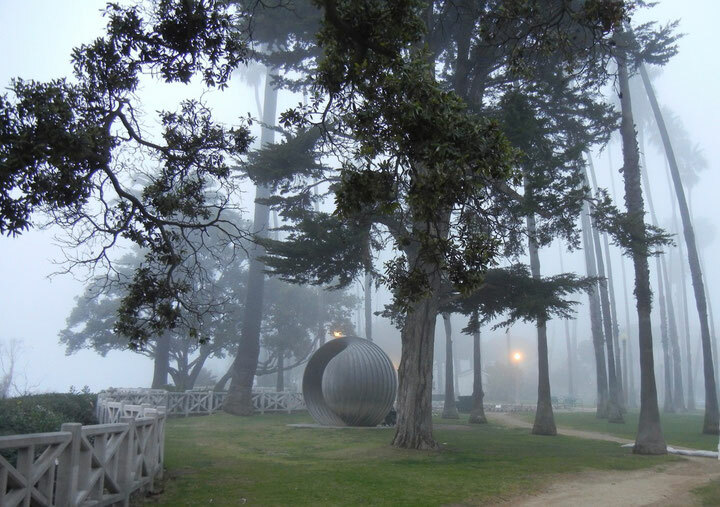 Above: Palisades Park has always, since the beginning of its time, been a passive park. But now, in recent years, it has suddenly gone active! The costs of "going active" to the city and to the Park are no slight matter and could double in the near future. 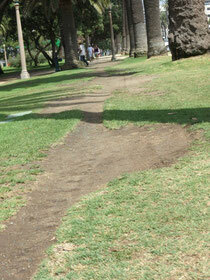 Converting a Park from passive mode to active mode requires the city to adjusts management strategies. Just the costs of retrofiting the lawns and soils for intense active use could run into the millions. This is a serious concern for a cash-strapped city management. The Most Important Question Facing City Council: Is Palisades Park Active or Passive? Erosion is the enemy of the Park, so why are we ignoring it? Excessive human activity compacts soils. When soils are compacted they lose their texture, microbiological processes cease to function, and rainwater cannot percolate into the soil. The Parks unique soils are a combination of clay and silt are thus highly susceptable to erosion. When rain falls, the water can't percoilate into hard compacted soils and will run off the surface. Eventually this rain overflows the park's edge and erodes the western bluffs. Are we recognizing the true economic value of this park? While the city may receive some revenue from trainers who use Palisades Park, a far larger industry, one critical to the economic viability of our city, absolutely depends on Palisades Park: tourism. 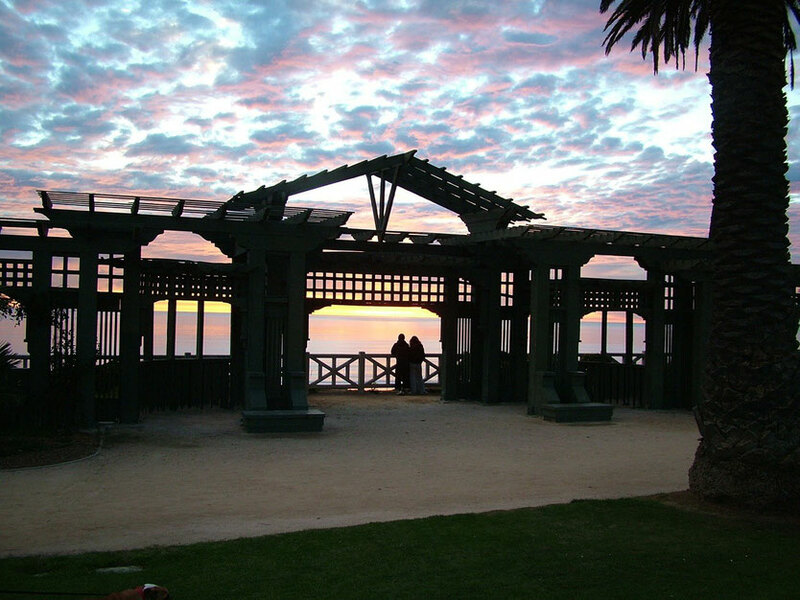 Palisades Park is the most significant natural open public space near doowntown. It provides shade, water, restrooms, green lawns, benches and spectacular views! 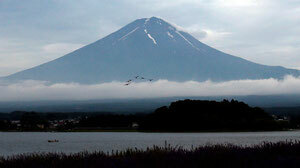 It is an vital enhancement for tourists on whom the city greatly depends. 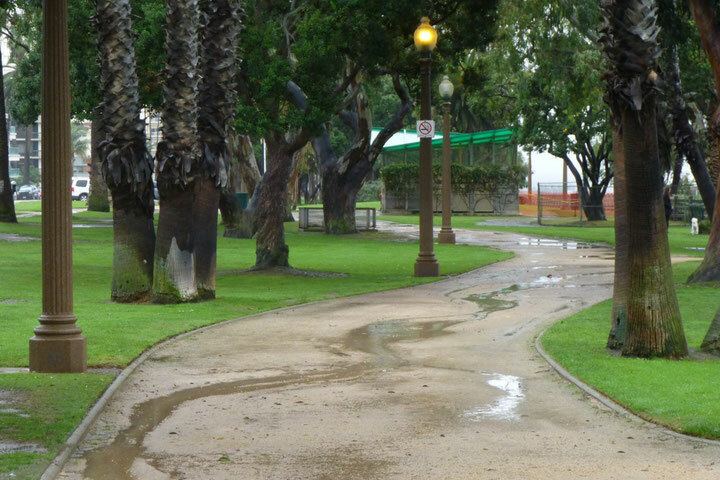 In developing the ciity's new Tongva Park, city staff envisioned a vital role for Palisades Park. How is Palisades Park like Atlas, the Titan? 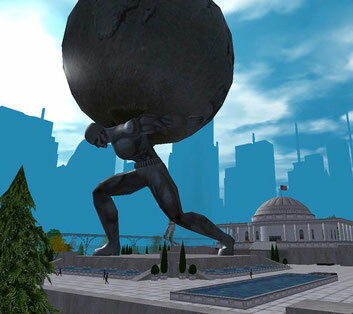 We often think of Atlas as the heroic Titan condemed by Zeus to the task of holding up the world. This is the image that Ayn Rand refers to in her philosophy. In the real story, Atlas was assigned the task not of holding up the sky, but of keeping the sky, not the earth, at bay. Why should Atlas hold up the sky? Because the sky is the source of all erosion, the most destructive force of the universe. When it rains and pounds, and pilages the land, it destroys and washes away terrestrial life. Thus, Zeus thought, the earth needs someone to hold the sky at bay; it needs a Titan, like Atlas. Atlas is a great symbol for Palisades Park, which in itself is a complex ecological system of soils and plants and trees who absorb the brunt force of all storms. This is the true reason for Palisades Park. It was built to hold up the sky. 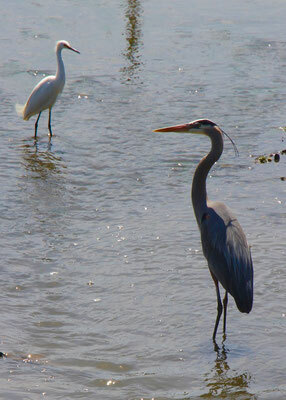 Read more about the history of this fascinating park. PLEASE SIGN THE PETITION HERE: Keep Palisades Park Green! Palisades Park has always been a special refuge for families, individuals and nature...except for as of late. It's been so sad to see the park degraded in so many ways by the numerous boot camps and excercise groups that have taken over much of the park. We can no longer enjoy our quiet picnics, or our cherished peaceful walks due to the plethora of loud and agressive training classes. It's tragic to see the grass worn down and the habitat compromised. Palisades park should not be a venue for commercial enterprises! My family and I support your efforts to keep the park as natural and as peaceful as possible Thank you so much for your efforts! I go to Palisades Park with my family and love to just walk there and unwind with my family. I hate to see the grass and plants dying because business people don't want to pay for space to run their businesses. I understand that some people like to work out in the outdoors. Perhaps we can all compromise and a certain area can be converted to "active" use that the trainers will rent from the city. The rent will pay for the conversion and ongoing maintenance. We are former So. Californians, who love to return to visit the Santa Monica area. Each time we spend refreshing hours in your lovely park, and would like to be able to vote to keep it as healthy and beautiful as possible. This is one of my favorite spots in the world. When I was traveling outside the state and outside the country a vision of Palisades Park in my memory is what kept me certain that I would return to Santa Monica. This park is life blood, soul food, relief, succor, sustenance, BEAUTY. I love the park and all its varied activities. Those who exercise on the park have inspired me to exercise. I lovew to see the park used for everything and everyone. Please keep it that way. Thanks for you comment, Nancy. Yes, we too love the park and we are inspired by all those who exercise there. But as with all things of nature we must also respect the beauty and life. We must exercise sustainably, and with a light footprint; we must leave the park and soils undisturbed in all their living, thriving, magnificance. 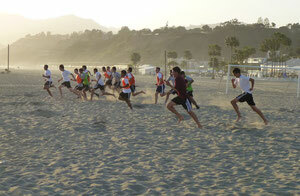 You, we, can all be Active and Sustainable in Santa Monica. 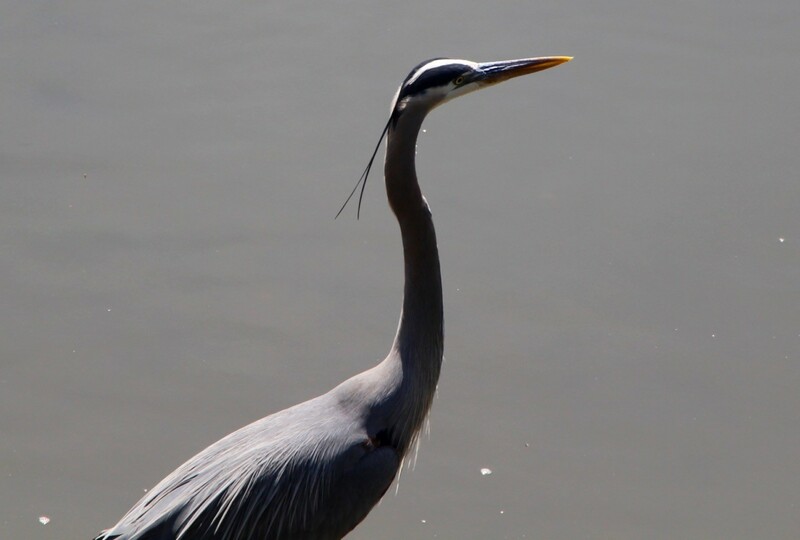 Learn more on how to do so in Palisades Park, a delicate and fragile ecosystem.